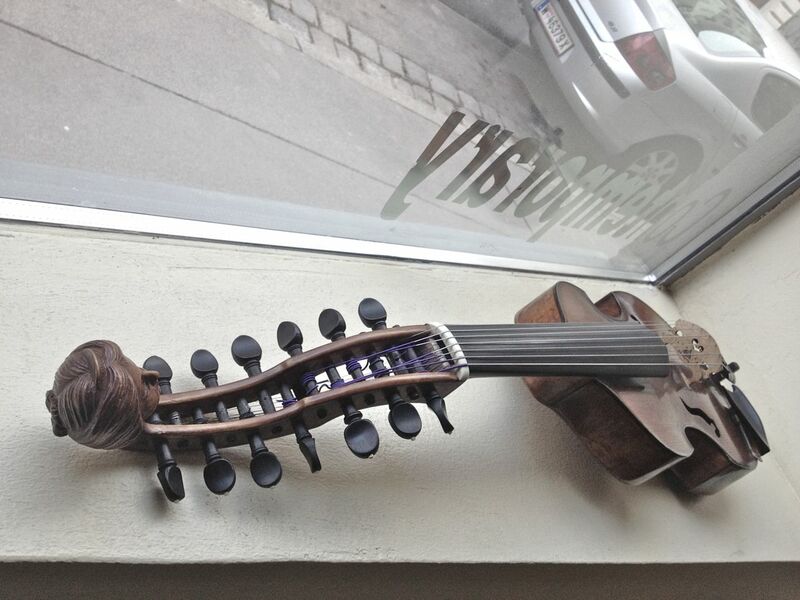 The Viennese instrument at Klangforum. in St. Paul’s Hall, Huddersfield on March 13th 2014. In the context of the viola d’ amore and sympathetic resonance, I became interested in both the musical and the social implications associated with the concept of resonance and with this particular instrument. Over centuries, qualities which were traditionally perceived as feminine – such as sympathy and resonance – have been assigned to the instrument. Therefore its neck was often decorated with a carved female head. The instrument was frequently used in connection with feminine contexts or main female characters by (mostly male) composers such as Leoš Janáček, or in Bernard Herrmann’s film music. As a contemporary composer and feminist, I take a shift here. I install a further form of sympathetic resonance in the composition, and in addition to a written score I use audio-scores to guide the performer. These are both sounds and texts transmitted through headphones or speakers to the viola player. The aural inputs filter different parameters in the four parts. In the last two parts they can also be heard by the audience. The resonant strings of the viola d’amore are amplified with a pickup and transduced into a sounding object. 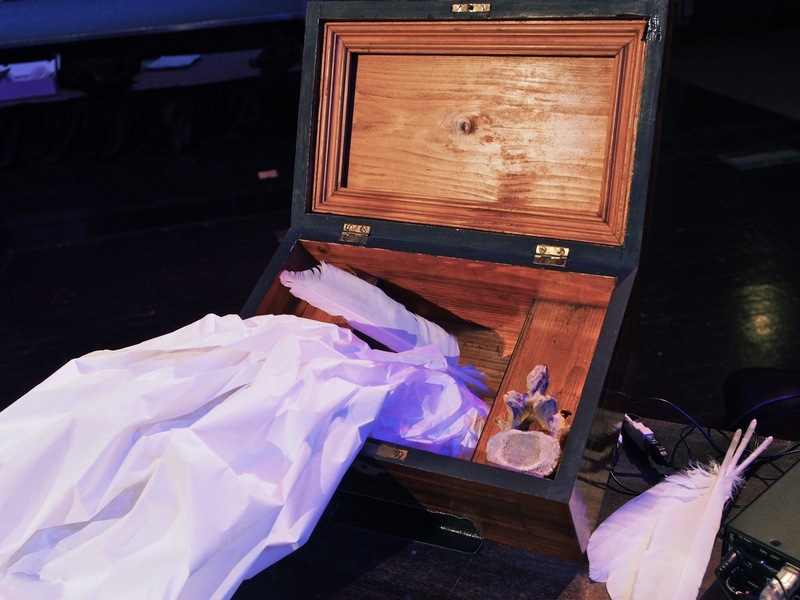 I install an empty wooden box, feathers and paper on stage to bundle resonance aurally and visually. The piece has four parts. Part 1 gives an audio score only to the performer, with instruction how to use it. Part 2 offers a written score for the left hand and a written plus audio score for the right hand, plus instruction on how to use it; both hands act completely separately for most of the time in this part. Part 3 offers another audio score, which is this time a text audible for everyone, out of the box; here, the contrabass recorder joins the viola d’amore. Part 4 again uses a short vocal audio score; the viola d’amore is played with feathers here. The following two samples of the live recording give an impression of the sound of the viola d’amore mixing with the woody sound out of the box. These samples are taken from parts 2 and 3 of the piece. I would like resonance to become a tangible object in itself, rather than space surrounding/supporting a central counterpart, as the traditional role model has been demanding of women – but not only women. There are numerous supportive roles in a society, mostly invisible and taken for granted. The question I asked myself here was: can resonance become a political statement? Feathers from a goose are used to excite sounds from the viola d’amore at the end. and most of all for the willingness to join in the experiment without hesitation. Thank you also to Dimitrios Polisoldis from Klangforum, who let me experiment with the viola d’amore owned by Fa. Thomastik-Imfeld in Vienna. I wrote the text during the composing process of the piece. The whispering voice of vocalist Claudia Cervenka was recorded in Vienna.